A multi-filter LN retinal model to simulate parallel processing by a population of retinal ganglion cells was proposed in  to test rank-order codes , a spike-latency based neural code. Dealing with filter-overlap in this model has been an area of concern [3, 4]. This is because data redundancy induced by over-sampling of a point in space affects the quantity of salient information during rapid information transmission . We propose a Filter-overlap Correction algorithm (FoCal) to deal with this problem of over-sampled data. The algorithm is based on the lateral inhibition technique  used by sensory neurons to deal with data redundancy , so that only salient information is transmitted through the optic-nerve bottleneck for rapid object detection and recognition. where r2 simulates the overlap corrected response latency of the ganglion cell corresponding to Φ2. However, we introduce lateral inhibition post-spiking whereas it is pre-spiking in biology. Thus, we substitute the stimulus strength e2 with the corresponding coefficient of filtering c2. The threshold frequency is also irrelevant in our case. Further, we implement a winner-take-all mechanism in each iteration of the algorithm: the largest coefficient inhibits all others, the degree of inhibition being proportional to O, which corresponds to K. This reduces redundancy in the coefficient set and helps prioritise salient information, thus enabling rapid recovery of perceptually important information  in rank-order encoded images. Using a data set of 65 images, we obtain the mean perceptually-important information recovery plot as shown (Figure 1). The error-bars show the standard deviation across the data set. We observe an increase of more than 20% in the total information recovered. 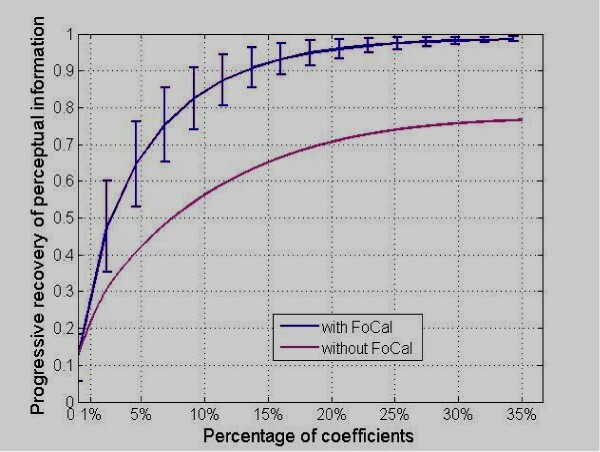 Moreover, the rate of information recovery is much faster, with 80% recovery using the top 10% of the coefficients, which is a 30% increase compared to rank-order encoding without using FoCal. Based on these results, we argue that FoCal provides a general method for coping with non-orthogonal basis functions for current and future biologically inspired visual models.